Too bad that Pablo Aimar wasn’t a Maple FC player. Just 48 hours after Trinidad and Tobago Football Association (TTFA) president David John-Williams wined and dined FIFA president Gianni Infantino and staged a celebrity match that included Aimar, a former Argentina World Cup playmaker, and ex-Colombia international striker Juan Pablo Angel—along with a host of former local stand-outs—came a less illustrious but far more meaningful contest. Maple FC, the Northern Football Association (NFA) champions, were tackling Eastern Football Association (EFA) winners, Skhy FC, in their opening fixtures of the Champion of Champions qualifiers. 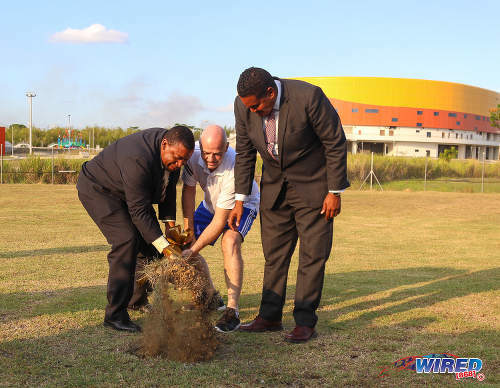 Photo: FIFA president Gianni Infantino (centre) and TTFA president David John-Williams (left) turn the sod at the Ato Boldon Stadium in Couva while Sport Minister Darryl Smith pretends to help on 10 April 2017. 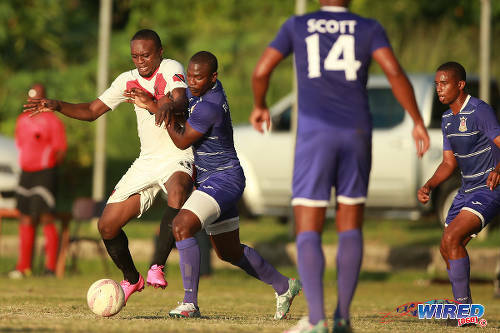 The six-team competition, which included winners from the Southern, Central, Eastern Counties and Tobago zones, was designed to select the two clubs that will be promoted to the Trinidad and Tobago Super League (TTSL). 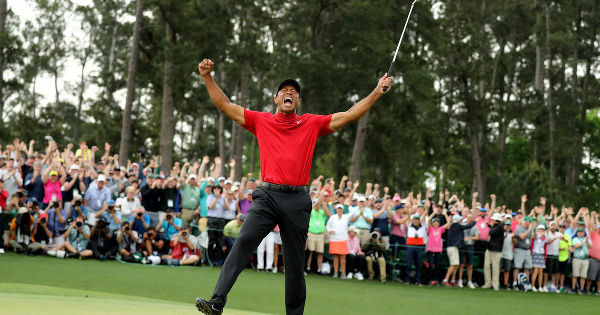 The month-long mini-tournament—six teams, five rounds and 15 matches—is the only competition that falls directly under the aegis of the John Williams-led administration. 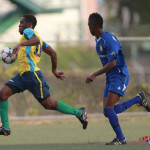 Yet, remarkably, the opening round descended into farce as Maple and Skhy turned out for battle at Squadron ground in Trincity only to discover that their 36 players plus coaches, officials and supporters had wasted a trip as the match was abandoned. Nearly 48 hours after the match, the TTFA still had not officially informed Maple as to the reason for the absence of match officials. It left a particularly sour taste in the mouths of the Maple squad, who are all amateur players and took time off from work to travel to Trincity for the fixture. 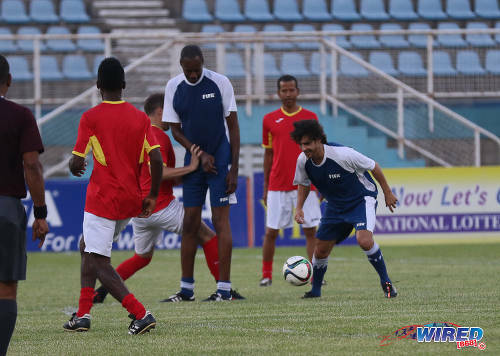 Photo: Former Argentina football star Pablo Aimar (right) runs with the ball while teammate Dennis Lawrence (centre) sets a screen during an exhibition match at the Ato Boldon Stadium in Couva on 10 April 2017. The TTFA was far less successful in conducting its own Champion of Champions tournament, just two days later. “We got there at 4:10pm because we were told to be there two hours before the game to fill in our team sheet for the match commissioner,” said Ramdoo. “But we were the only ones there. We waited until 5pm when [players from] the other team came in. 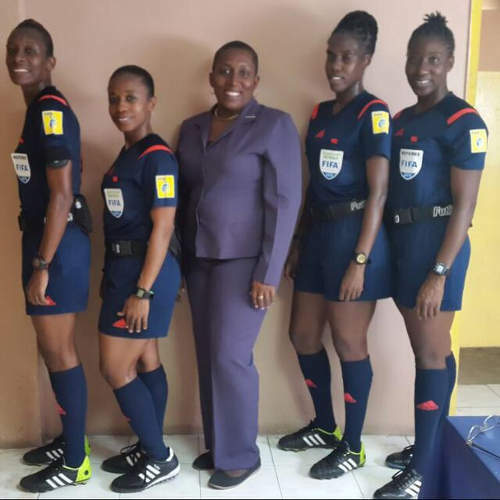 […] The match commissioner, Marcelle Williams, eventually came. We were told we would get team sheets to fill out from the commissioner but that never happened, so we had to do it up ourselves. 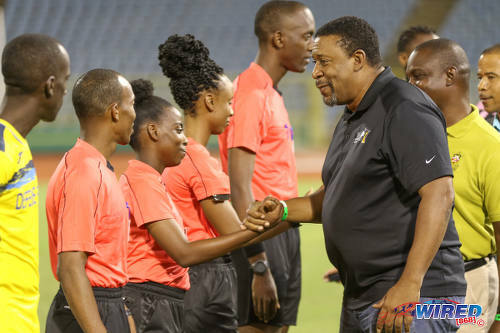 Trinidad and Tobago Referees Association president Joseph Taylor was also unsure about what went wrong although he hinted at two possible scenarios. 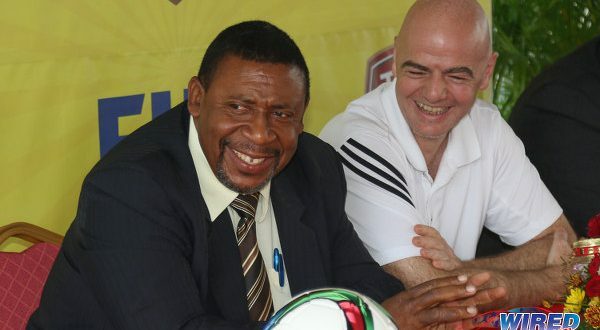 Wired868 was informed, on condition of anonymity, that the East Zone referees boycotted the match because of unpaid monies. However, the other two fixtures were played as scheduled and Ball Runners and Pitchmen FC beat Dream Makers and Sidney FC respectively. 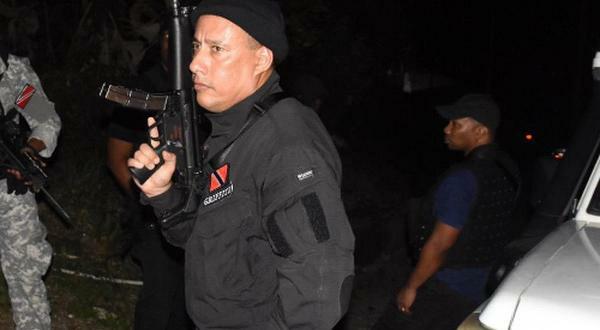 Two days after the opening round of matches, TTFA vice-president Ewing Davis, who heads the tournaments and competitions committee that also includes Sharon O’Brien, was still none the wiser about the incident at Squadron ground, though. It was scant consolation for Maple. “We had to hire a maxi and hire a physio,” said Ramdoo, “we had to write letters to fellahs’ employers for them to get time off to go to the game—since we had to leave Port of Spain at 3pm—and then we get there and no game. “We had a deadline to pay a caution fee of $2,500, otherwise we couldn’t play in this tournament. So if we don’t show up or if the field is not prepared or so on, they take the money. I have no problem with that. But when this happens, what is the TTFA paying the teams as compensation? 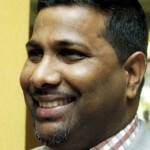 Ramdoo complained that the TTFA was doing nothing to help the teams book grounds for matches, plane tickets or anything else necessary to compete—unlike what they were accustomed to in the All Sports Promotion-run Super League. Worse, the TTFA—despite boasting about being awash with cash—has offered no prize money whatsoever for teams involved in the Champion of Champions competition. “They said the prize is if you come first or second, you get promoted to the Super League,” said Ramdoo. Ironically, at the same time, the John Williams-led administration is frustrating the new Super League and there are question marks as to whether it will get off the ground at all in 2017. And, even if Maple were successful, then—on top of the money spent participating in the Champion of Champions—the amateur club would then have to find TT$43,500 to enter the Super League, which covers their competition fee, annual membership fee and caution fee. 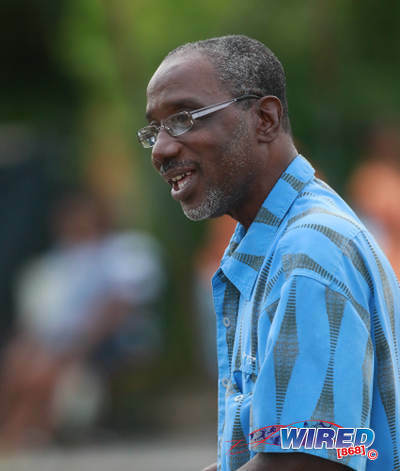 Ramdoo said Maple will spend around TT$8,000 on just one match when they head to Tobago to face Sidney FC on 26 April. Photo: Tobago FC Phoenix 1976 attacker Lejandro Williams (left) tries to hold off a Defence Force player during 2015/16 CNG National Super League action at the Canaan Recreational Grounds, Tobago. “The game is scheduled around the Jazz Festival and the boat is fully booked so that is 20 [players and officials] at $300 each,” said the Maple coach. “The only flight available is at noon, so we had to get someone from Tobago to cook our meals. That is another $1,400. Then we had to hire a maxi from Crown Point to Speyside for another $1,000. “And all this we have to spend in a competition with no prize money. We have three away games so we will spend about $20,000 for this tournament and, if we come third, we have nothing to get. Not that the prize money is as much help as it should be much of the time. 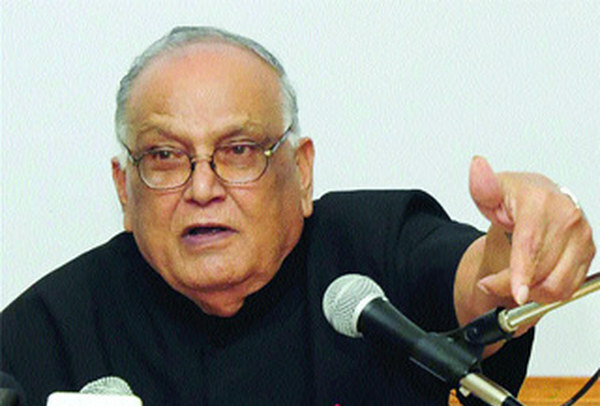 Ramdoo pointed to the WOLF league and its own issues. “The women’s prize is $12,000 but it is $2,000 to register and then you have to get two sets of uniform,” said Ramdoo. “Last year, we had to pay $6,000 to go to a game in Tobago—so that is most of that prize money gone there already. “And you know what is the greatest thing? When you win the league, they tell you have to wait until next year to get your prize money. Photo: WOLF president and Trinidad and Tobago Football Association (TTFA) employee Sharon O’Brien (centre). Next Wednesday, Maple are scheduled to host Sangre Grande Dream Makers from 6pm at the Hasely Crawford Stadium training ground in Port-of-Spain. But the club is struggling to afford the cost of lights and suggested a 4pm kick-off instead. An early start to the match might affect the availability of players from both teams. So, over the Easter long weekend, Maple officials are trying to find a middle ground with the facility managers over costs. 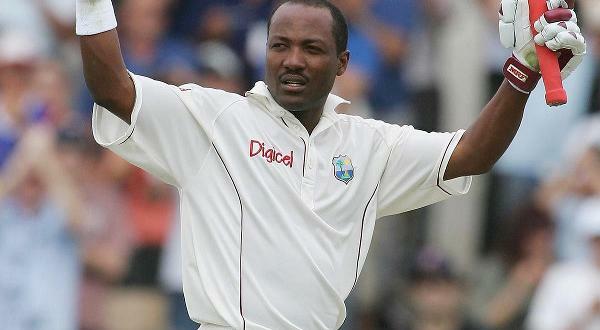 Ramdoo doesn’t expect that his club will be able to make a final decision until Tuesday. On Monday, John-Williams, flanked by Infantino and Sport Minister Darryl Smith, painted a rosy picture of football under his watch. 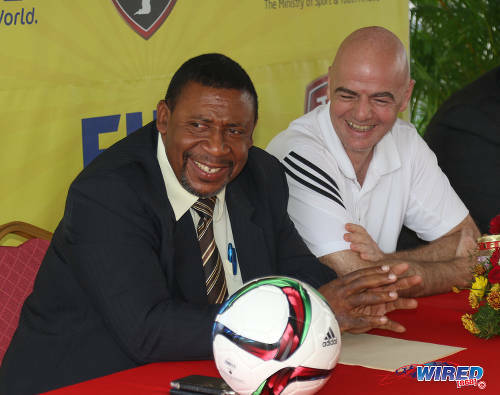 The TTSL, Central Football Association, Trinidad and Tobago National Futsal Team, former technical directors Kendall Walkes and Anton Corneal and a string of national coaches, including Stephen Hart, Ken Elie and Clayton Morris might beg to differ. Add the frustrated Maple squad to the list of discontented stakeholders. Distressing story. Would like more on story of monies owed to, and TTFA plan to pay, officials. ..I was there. I felt it for both teams. SKHY put out resources to prepare the field: well marked, flags, nets, ball kids. And TTFA messed up. Not ONE TTFA official was present. Recovering from the Infantino dinner I guess..
..History repeats itself. First as tragedy. Second as farce.While some playing international politics others suffering from the domestic stagnation and decay. 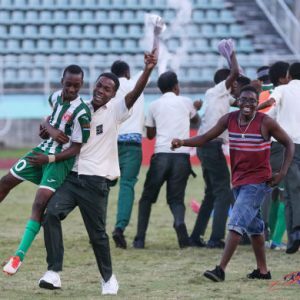 TTFA killing local football and frustrating the ONE progressive development in the domestic game over the past fifteen years – TTSL. Time for these people to GO! Smh. That’s sad. The referees head should raise that in an Emergency General Meeting. Because the TTFA has the money to pay if they wanted to Devon and Kurt Arsenal Harry. Careful what yuh wish for, Ramah. With DJW and this TTFA, yuh pretty sure yuh go get it. What are they telling the referees about their debt? And is that some referees are boycotting and some aren’t? We had an AGM last Sunday,the conceses was we are fed up of not being respected by the powers that are in charge,how the hell you could not pay us since August last year for pro league and super league,and want to start back these leagues how! On top of that flow sponsors the youth pro league but referees are being asked to officiate in the friggin burning heat and be paid eighty dollars for our service ,come on that’s so unfair man. We are on the same page,a boycott was not on the cards as yet but we have told our head that we are fed up and something needs to be done.